These are people who simply didn’t allow unwritten “rules” to direct them. Most them, like Steve Jobs, wrote their own rules of competition. Also be sure to watch this week’s UNCOPYABLE Business episode where I share three things about Herb I liked the most! I wish I’d sent him a copy of my book. 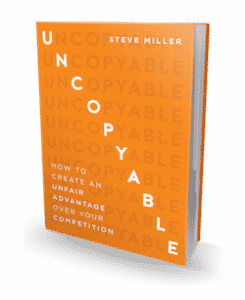 I wrote about a great experience I had on Southwest Airlines in my book, UNCOPYABLE: How to Create and Unfair Advantage Over Your Competition. It’s on page 89 for those of you who have my book. Thanks for talking about Herb – and about “Nuts,” which is one great business book.